On behalf of Canadians and Americans moving to London—particularly those expats who have already made their international relocation to the UK—I’d recently given a nod to both Canada Day and the American Independence Day in London. It’s only fair to likewise give a shout-out to the French expats living in London as they celebrate an independence day of their own. Today is La Fête Nationale, le quatorze juillet…a.k.a., Bastille Day! 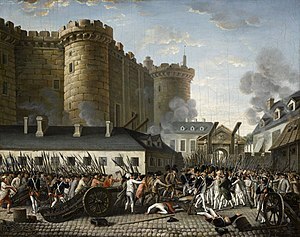 This French national holiday commemorates the storming of the Bastille prison on 14 July, 1789 at the start of the French Revolution (raise your hand if you remember your Tale of Two Cities unit in English class!). This was a key event that symbolizes the overthrowing of the traditional monarchy and making way for the modern nation, thus, this date is what France regards as its national independence today. Festivities include balls throughout Paris as well as dancing in the Bastille square the evening before, and, on the day itself, a grand parade along the Champs-Elysées to kick off the day-long celebrations that will ensue. If you happen to be in Paris, check out details of where you can find the action. The London to Paris commute is a super easy one to make (you might want to get vaccinated for Paris Syndrome, though ;)). However you celebrate, take heart that even a relocation allows you as an expat to celebrate your roots. “Home” will never be further away than your heart. And when it comes to getting situated in a comforting home-away-from-home, a relocation company like us can help. Our relocation services will help you find that ideal London apartment to rent so you have a home base for your festivities!